Good afternoon and happy Thursday everyone! 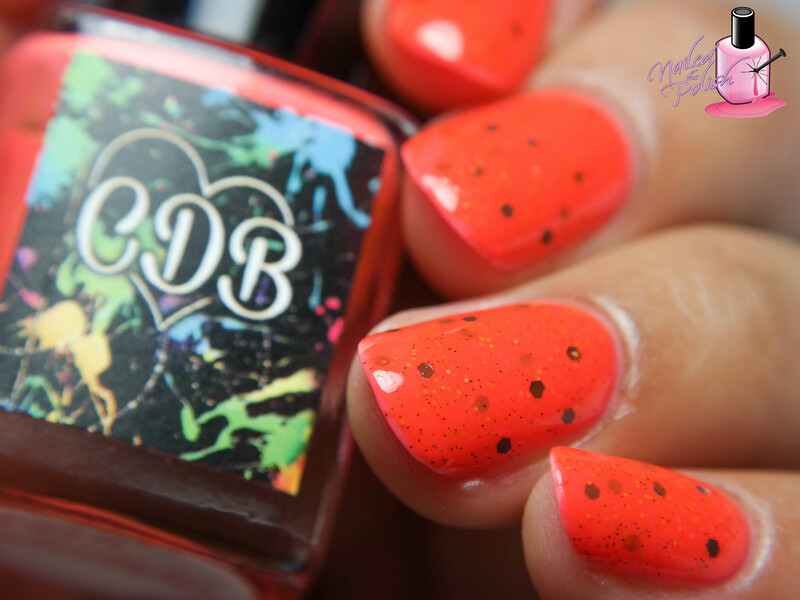 Today I have swatches of CDB Lacquer‘s new summer crelly trio that is releasing tomorrow July 3rd! Fresh Watermelon is a bright red pink crelly with neon yellow/green micro glitters and black circle and hex glitters of different sizes. Shown here is two coats plus top coat. My camera picked up this polish as more orange rather than red pink. In real life, I would say it’s red orange with a hint of pink. The formula of this polish is amazing! The glitters don’t have any effect in how this polish applies. One of the best crelly formulas I’ve swatched! Poolside party is a bright turquoise crelly with purple, pink, lime green, and white glitters in various sizes and shapes. Shown here is two coats plus top coat. This polish is so much fun! It’s jam packed full of glitters that required no fishing at all. Since it is so jam packed, the formula is a little bit thicker but nothing out of the ordinary. It dries a little uneven (due to the glitters) but I found that one coat of top coat smoothed everything out. Last up in the trio is Sassy Swimsuit – a bright fuchsia with vibrant blue, pink, purple, and white glitters of various shapes and sizes. Shown here is two coats plus top coat. As you can see, this one too is jam packed full of glitters and the formula was nice to work with. Of the three, this is my favorite.. And quite possibly my favorite crelly that I own! The glitters and the base compliment each other so well. One isn’t trying to grab your attention more than the other – it’s like they are working together in perfect harmony! What a lovely trio! I love how bright and fun each of the polishes are! The formulas are really nice to work with and I had no issues with glitter dispersion. If you love crellies, I would definitely recommend picking up at least one from this trio. My favorite is hands down Sassy Swimsuit – I just love it so much! The trio will be released tomorrow July 3rd and will be available for purchase here. These polishes are only available in full size and will be $8.00 each. 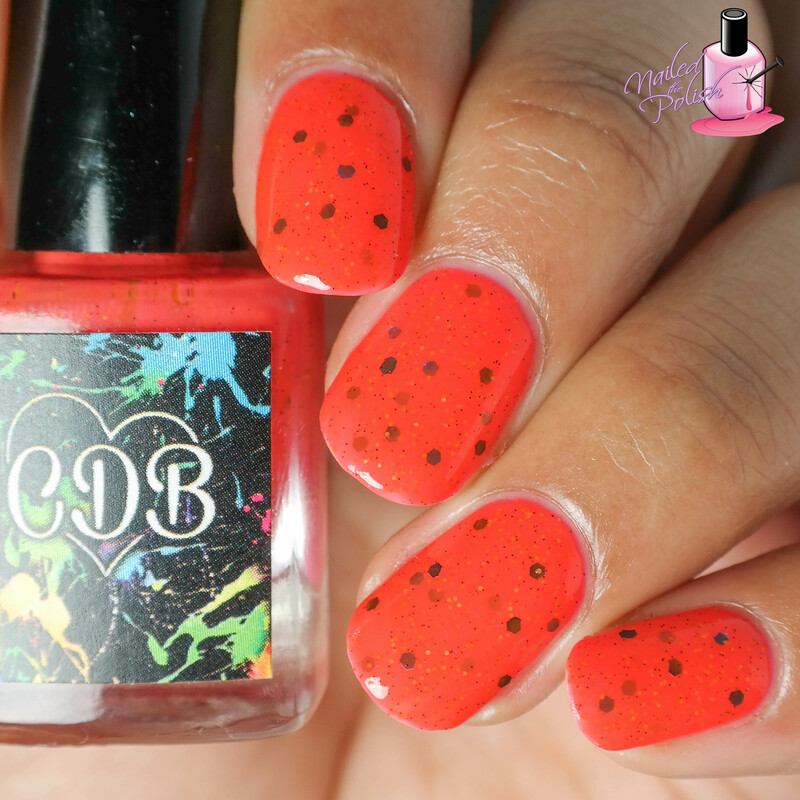 Don’t forget to check out CDB Lacquer on Instagram and Facebook for more! Thank you !! I’m so glad you enjoyed them! !